Our old Army buddy and Ron’s platoon leader from Fort Hood, Texas. He reminded us often that he was Italian and that he was from Nebraska, two things he was most proud of. 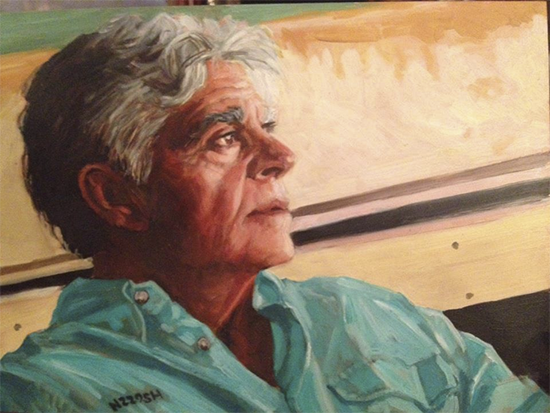 Found this marvelous portrait of Steve on his daughter’s Facebook page. Typing Steve’s resume when he was leaving the Army after Viet Nam and returning to civilian life. He had an old portable typewriter that he brought to our house for me to work on. After a zillion typings, the project was complete to his satisfaction — and Steve took me out to dinner at the Officers’ Club. While we were out, my dear tomcat (Barney) saw fit to spray the typewriter. For 20 years after that, Steve never let me forget! Driving to Fremont, MI to surprise Steve on the morning of his 50th birthday party — when the Merrill family hosted a big brat cook-off for him at their home. Steve celebrated by firing off his miniature cannon, much to the neighbors’ chagrin. Doing the ‘Duval Crawl’ with Ron in Steve’s chopper. We flew low over downtown Key West and then out over the ocean. Ron and Steve spied sharks in the water, so Steve turned the chopper on it’s side so I could look out the open door easier!! Scared me to death! A 25-year resident of Key West, Steve Turco died Monday, Nov. 19, 2012. He was born in 1942 in Omaha, Neb., and grew up in Ogallala. Steve graduated from the University of Nebraska, and served in Vietnam as captain with the 1st Cavalry of the Army. He was a decorated combat helicopter pilot. Following Vietnam, Steve moved to Denver, got married and started a family. He entered the commodity business with Peavy Company. Along with a partner in Denver, Steve opened a Maduff and Sons office, a commodities brokerage, and held a seat on the Chicago exchange. After moving to Key West in 1987, he was able to renew his passion for aviation. Entrepreneurial ventures in Key West included owning and operating a helicopter tour service and teaching private flying lessons. Steve was an avid aviator, holding multiple flight ratings, and most enjoyed his flights to Alaska, the Dominican Republic, the Bahamas and Belize. His aviation highlight was in early 2000, when he obtained approval for and succeeded in landing the first general aviation aircraft in 40 years to fly from Key West to Havana, Cuba. In other notable endeavors, Steve served as a pilot with the Colorado Air National Guard and volunteered his time with the Navy League in Key West. Steve lived life to its fullest, appreciating every day. He filled his days with fishing, hunting, golfing, woodworking, practical joking, hanging with friends and the occasional antics of pyrotechnics. No bang was ever too big for Steve. Above all of Steve’s life accomplishments, he was most proud of being a father and grandfather to his daughter and two beautiful grandchildren. 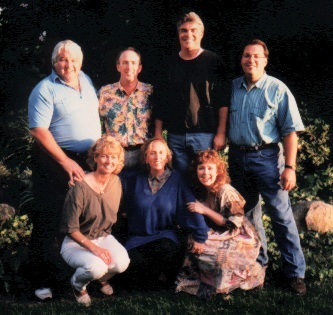 Steve is survived by his wife, Holly S. Merrill; his daughter Jennifer (Kenneth) Seifert, grandson Camden and granddaughter Teagen; sister Karen (Keith) Turco Rogers, her sons Dane and Shawn; brother Michael (Cindy) Turco, their children Whitney, Stephanie, and Joseph; first wife Lynn Marshall, mother of Jennifer; Frank (Robin) Merrill; Kyle (Mike) Converse; Danielle Merrill; and nieces and nephews. A celebration of Steve’s life will take place from 3 to 6 p.m. Monday, Nov. 26, 2012, at Louie’s Backyard. Interment is being planned at Arlington National Cemetery. In lieu of flowers, remembrances may be made to the Stephen P. Turco fund at the Community Foundation of the Florida Keys for the assistance of wounded veterans.